Police in the Democratic Republic of the Congo (DRC) launched tear gas at hundreds of protesters who wielded sticks and shovels during a demonstration on Tuesday against the recent arrests of youth political leaders. The protest occurred in Lubumbashi, the DRC's second-largest city, near the country's southern border with Zambia. The action followed the detention on Monday of 15 members of the youth wing of the country's UNAFEC party. The demonstrators reportedly "shouted abuse" at the officers before the tear gas was fired, according to Reuters. The clashes follow months of unrest precipitated by speculation that President Joseph Kabila may attempt to extend his tenure ahead of elections that are scheduled for next year. The UNAFEC was previously forced out of Kabila's governing coalition when it expressed opposition to the leader staying in power. "This shows the bad faith of the government in place," UNAFEC President Gabriel Kyungu wa Kumwamza told Reuters. He said 15 people were detained, including Kabulo Shimbe Zasou, the leader of the party's youth wing. The controversy surrounding Kabila's future as leader has sparked months of violent protests amid a crackdown on opposition groups in the central African nation of 67.5 million. Voters are expected to go to the polls in 2016 to choose a new president. Kabila is constitutionally barred from seeking a third term. If he steps down and peacefully hands over power to his successor, it would be the first democratic leadership change in the DRC's history. The 44-year-old Kabila rose to power in 2001 after his father and then-President Laurent Kabila was killed. He presided over a transitional government that was established in 2003, ending five years of civil war that left as many as 3 million people dead. Kabila was democratically elected in 2006 and again in 2011. The resource-rich country was known as Zaire from 1971 until 1997, and was ruled for decades by Belgian-backed dictator Mobutu Sese Seko. In January, a proposed law that likely would have delayed the 2016 election by requiring the completion of a national census sparked widespread protests. Opponents felt the census was a means to keep Kabila in power. After a few days of demonstrations in various parts of the country, the situation escalated in the capital Kinshasa and the eastern city of Goma on January 19. In a swift and brutal clampdown, police fired on demonstrators at the University of Kinshasa and took similar action in Goma. Human Rights Watch reported that at least 36 people were killed in violent clashes over the proposal, including a police officer in Kinshasa and four civilians in Goma. The DRC's government backed down from the census plan after the protests, but security forces have since cracked down on opposition and youth movements. Authorities detained some 40 people on March 15 following an event organized by Filimbi, a pro-democracy youth platform in Congo, and the US Embassy. Several foreign journalists and a US diplomat were taken into custody and released. On Tuesday, DRC police detained five members of the Lucha youth movement as they demonstrated against the March arrests in Kinshasa. 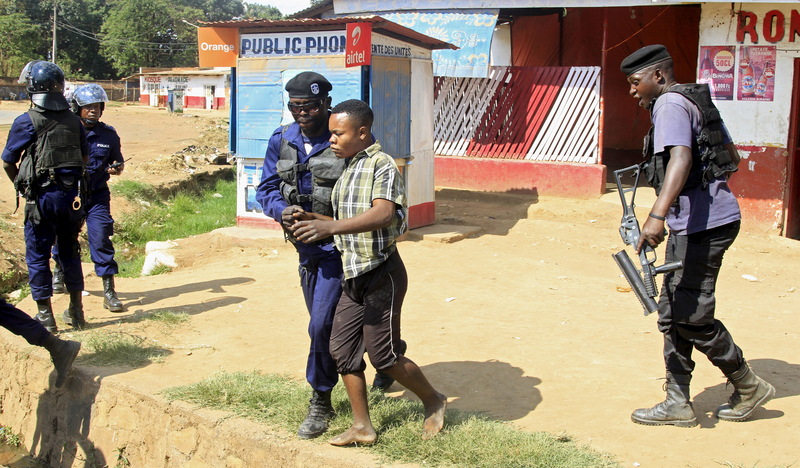 "The Congolese government's detention of pro-democracy activists is the latest alarming sign of a crackdown on peaceful protest ahead of next year's presidential elections," said Ida Sawyer, senior Africa researcher at Human Rights Watch. Kabila has remained silent about his plans to extend his tenure. During a visit to the DRC in 2014, US Secretary of State John Kerry called on Kabila to oversee a peaceful transition and not seek another term in office. "Clearly, the United States believes that a country is strengthened, that people have respect for their nation and their government, when a constitutional process is properly implemented and upheld by that government," Kerry said. "He has an opportunity, which he understands, to be able to put the country on a continued path to democracy." If Kabila does decide to seek a third term, it would fit a regional trend that has seen several leaders cling to power. In April, Burundi's President Pierre Nkurunziza sparked months of protests and violence when he announced plans to run for a constitutionally-barred third term — a move ultimately approved by the country's constitutional court. The Rwandan government has gone through a series of steps in recent months to allow President Paul Kagame to run for a third term in office. The Republic of Congo, the DRC's western neighbor, approved a constitutional referendum last month that cleared the way for President Denis Sassou Nguesso to extend his rule. Nguesso was previously barred from seeking a third term, and his regime recently quashed widespread protests in Brazzaville, the country's capital and largest city.